The aircraft are powered by two Garrett TFE731-2 turbofan engines. Its cabin can be arranged for 6-8 passengers. The longer-range Model 36 has a shortened passenger area to provide more space in the aft fuselage for fuel tanks. By 2018, 1980s Learjet 35As start at $500,000. In 1976 American professional golfer Arnold Palmer used a Learjet 36 to establish a new round-the-world class record of 22,894 miles (36990 km) completed in 57 hours 25 minutes 42 seconds. Learjet 35s made the bulk of Escuadrón Fénix during the 1982 Falklands War mainly on diversion flights. As of January 2018[update], the U.S. National Transportation Safety Board database lists 25 fatal accidents for the 35/35A, and two for the 36/36A. Finnish Air Force Learjet 35AS. The original Model 35 was powered by two TFE731-2-2A engines and was 13 inches longer than its predecessor, the Model 25. First flight of the prototype Model 35 was on 22 August 1973, and the aircraft was FAA certified in July, 1974. It could carry up to eight passengers. There were 64 base-model 35s built. On February 12, 1996, a Learjet 35A, N10BD, owned by Cable Television Founder Bill Daniels and piloted by Mark E. Calkins, Charles Conrad, Jr., Paul Thayer, and D. Miller completed an around-the-world flight in a record 49 hrs, 21 min, and 8 sec. The record remains standing as of 2015[update]. This aircraft is now on display in Terminal C of Denver International Airport. A C-21A Learjet attached to the North Dakota Air National Guard's (NDANG) 119th Fighter Wing. 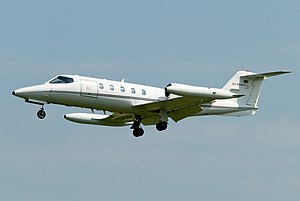 The C-21A is a United States military designation for an "off the shelf" variant of the Learjet 35A for the United States Air Force, with room for eight passengers and 42 ft³ (1.26 m³) of cargo. In addition to its normal role, the aircraft is capable of transporting litters during medical evacuations. Delivery of the C-21A fleet began in April 1984 and was completed in October 1985. There are 38 Air Force active duty aircraft, and 18 Air National Guard aircraft in the C-21A fleet. On 1 April 1997, all continental U.S.-based C-21As were realigned under Air Mobility Command, with the 375th Airlift Wing at Scott Air Force Base, Illinois, as the lead command. C-21As stationed outside the continental United States are assigned to the theater commanders. A Japanese military designation for a Combat support variant of the Learjet 35A for the Japan Air self Defense Force (JASDF). At least six built. A Japanese military designation not a U.S. military designation. Utility transport, training version of the Learjet 35A. Equipped with a missile seeker simulator in addition to a radar, avionics, firing training assessment devices, an ejector pylon, a special communications system, a target towing system and a jammer system. Four were built for the Japan Maritime Self-Defense Force. On 7 June 1982, during the Falklands War, a Learjet 35 of Argentina's Escuadrón Fénix was shot down by HMS Exeter. The aircraft had been participating in a reconnaissance mission when it was hit by a Sea Dart surface-to-air missile launched by the destroyer. All five crew were killed. On 13 February 1983, a Learjet 35A carrying Sri Lankan business tycoon Upali Wijewardene disappeared over the Straits of Malacca (Malaysia). The wreckage has never been found, nor any trace of Wijewardene, his top executives, or crew. On 17 September 1994, a Learjet 35A owned by Golden Eagle Aviation was accidentally shot down by the Republic of China Navy while being used as a target tug. All 4 crew on board were killed. On 17 April 1995, a C-21 crashed into a wooded area near Alexander City, Alabama killing the two pilots and six passengers, including Clark G. Fiester, assistant secretary of the Air Force for acquisition, and Major General Glenn A Profitt II. The 1996 New Hampshire Learjet crash on Christmas Eve, 24 December 1996, in which a Learjet 35A crashed in New Hampshire, leading to the longest missing aircraft search in that state's history, lasting almost three years, and eventually resulted in Congressional legislation mandating improved emergency locator transmitters (ELTs) be installed in U.S.-registered business jets. On 29 August 1999, a U.S. registered Learjet 35A owned by Corporate Jets, Inc., was shot down near Adwa, Ethiopia, while flying from Luxor, Egypt, to Nairobi, Kenya, with the loss of three persons. On 25 October 1999, professional golfer Payne Stewart was killed in the crash of a Learjet 35. The plane apparently suffered a loss of cabin pressure at some point early in the flight. All on board are thought to have died of hypoxia, lack of oxygen. The plane, apparently still on autopilot, continued flying until one engine flamed out, most likely due to fuel starvation. It crashed near Aberdeen, South Dakota after an uncontrolled descent. The exact cause of the pressurization failure and the reason behind the crew's failure or inability to respond to it has not been definitively determined. On 9 March 2006 Argentine Air Force Learjet 35A serial T-21 struck terrain and broke up shortly after takeoff from El Alto International Airport in La Paz, Bolivia killing all 6 on board. The Learjet was sent to Bolivia to deliver humanitarian aid. On 4 November 2007, a Learjet 35A crashed in São Paulo, Brazil, after a failed takeoff attempt. It destroyed a house in a residential area near the Campo de Marte Airport, killing the pilot, co-pilot and 6 people of the same family who were in the house. On 24 June 2014, a Learjet 35A of the Gesellschaft Für Flugzieldarstellung (GFD) was involved in a mid-air collision with a Eurofighter Typhoon of the German Air Force and crashed at Olsberg, Germany. On 9 November 2014, a private Learjet 36 crashed in Freeport, Grand Bahamas, Bahamas. The jet struck a shipping crane at the Grand Bahama Ship Yard, exploding on impact and crashing into the ground near a junkyard area. The plane was en route from the Lynden Pindling International Airport with nine people on board heading to Grand Bahama International Airport. All nine persons perished, including Myles Munroe, a Bahamian pastor. The Learjet 35 is operated by private, corporate and air taxi operators. Argentine Air Force - operates a single Learjet 35 as of December 2016[update]. Brazilian Air Force - six in service as of December 2016[update]. Chilean Air Force - two in service as of December 2015[update]. Finnish Air Force - three in service as of December 2016[update]. Japan Maritime Self Defense Force - four Learjet 36 in service as of December 2016[update]. Peruvian Air Force - one Learjet 36 in service as of December 2016[update]. United States Air Force - 29 C-21A in service as of December 2016[update]. United States Navy - Two Learjet 35/36s as of December 2016[update]. ^ "Video of N10BD in flight". ^ "General Aviation World Records, Sub-class C-1f, turbojet. Perform a Record Number Search for 3113 by clicking Records Tab, More Records Button, then entering Record Number 3113 in the search". Fédération Aéronautique Internationale. ^ "Mounting N10BD in C Concourse of Denver Intl Airport". ^ "ASN Aircraft accident Learjet 35A B-98181 Taitung". ASN Aircraft accident Learjet 35A B-98181 Taitung. Retrieved 21 July 2016. ^ "Taiwan navy gunners kill crew by accident". Ocala Star-Banner. Sep 18, 1994. Retrieved 21 July 2016. ^ Hoyle Flight International 6–12 December 2016, p. 29. ^ Hoyle Flight International 6–12 December 2016, p. 31. ^ Hoyle Flight International 8–14 December 2015, p. 35. ^ Hoyle Flight International 6–12 December 2016, p. 35. ^ Hoyle Flight International 6–12 December 2016, p. 39. ^ Hoyle Flight International 6–12 December 2016, p. 44. ^ Hoyle Flight International 6–12 December 2016, p. 51. ^ Hoyle Flight International 6–12 December 2016, p. 52. ^ Taylor 1980, p. 342–343. ^ Taylor 1980, pp. 340, 342. Hoyle, Craig (8–14 December 2015). "World Air Forces". Flight International. Vol. 188 no. 5517. pp. 26–53. Hoyle, Craig (6–12 December 2016). "World Air Forces Directory". Flight International. Vol. 190 no. 5566. pp. 22–53. Taylor, John W. R. (1980). Jane's All The World's Aircraft 1980–81. London: Jane's Publishing Company. ISBN 0 7106-0705-9. This page was last edited on 16 April 2019, at 22:37 (UTC).